Cultures around the world consider certain foods to be good luck when eaten at the New Year. While most of these foods symbolize prosperity, wealth and financial reward, they also deliver a nutritious bang for their buck. 3. Meanwhile, heat remaining 2 tsp. oil in large skillet over medium heat. Add bacon (or smoked paprika), onion, celery, garlic, and remaining 1/2 tsp. chili powder. Cook 8 minutes, or until translucent. 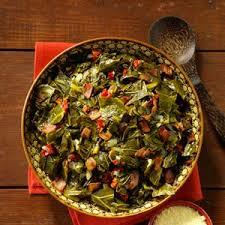 Add collard greens, vinegar-agave nectar mixture, 1/4 cup reserved cooking liquid, 2 Tbs. vinegar, and remaining 1/2 tsp. salt. Cover, and cook 10 minutes, or until greens are tender. Transfer to serving platter. 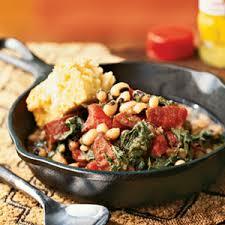 Love this served with cornbread, Oh yeah yummy!